What's new for MAN vs MUD 2015? Our team is working hard to improve MAN vs MUD each year to bring you a better course and more fun in 2015. Stay tuned for more details on what you can expect for 2015. We took your feedback and suggestions from last year and have worked hard to make the 2014 MAN vs MUD event even better! We've modified the route slightly to enhance the run for participants and added a number of spectator viewing areas. Sweet! Even more obstacles have been added to our already amazing course. We're making them smoother and softer. And a few of the slides will incorporate new elements. The slides and other obstacles will have multiple lanes to accommodate more runners. That's just a few of the major improvements we've got for 2012. There are many other improvements that we're working on to make this years event even more incredible!! WELLSVILLE—Cheers electrified the air as people ran, swam and crawled through mud to the finish line Saturday. More than 2,000 people signed up to run Cache Valley’s dirtiest 5-kilometer (3-mile) race at the American West Heritage Center at the Man v. Mud Run, an obstacle course that covered competitors from head to foot in mud. Some runners wore costumes during the mud battle. Chickens, ninja turtles, pigs or crusaders with capes, goggles and underwear outside their leggings could be seen navigating their way through the muddy courses. Tyler Hill and his family dressed up as gnomes with red pointy-coned hats, goggles, tutus and white tank tops with the words “dirty gnomes” printed on them. Hill said the whole point of the race was to make good memories and have fun. The entire course was filled with at least 25 obstacles, starting with a giant slip n’ slide. Then racers had to pass through a “shooting range” where a line of spectators soaked participants with squirt guns. After another small water slide, runners had to weave through large inflated plastic bags hung in a small open shack. Racers scrambled over a wall of hay bales, ran through a muddy field, waded in waist-deep muddy water and attempted to run on a slippery inflatable bridge over a large muddy pond. Those who failed to make it across the bridge had to swim for it. “It was the best three miles of my life,” said Whitney Lundbrg, 19, who convinced her boyfriend, Jason Nelson, to run the race with her. Nelson said the best part was the final waterslide at the end, with a large mud pit awaiting racers at the bottom. 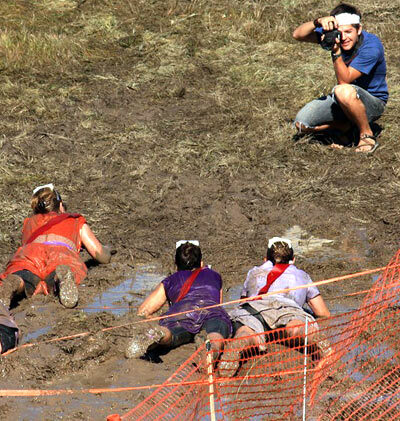 When they reached the finish line, photographers took photos of the mud-drenched participants. Despite the large turnout, there were no major mishaps during the event. A few bumps here, some bruises and a possible twisted ankle, but participants seem to have played the course pretty safe. Prizes were awarded to participants for costumes, team names, racing enthusiasm and for whoever got the muddiest. For kids 12 and under, who couldn’t manage the 5k, were given their own obstacle course to combat. The “Boggy Bayou” included suds to slide through, an inflatable castle to explore, tunnels, tires and plenty of mud. Kids could do the obstacle course as many times as it pleased them. Runners paid $40 in advance and $50 at the event to participate. Mike Schaefer and David Knight organized the race, but were not available for comments. Information, photos, videos and contest winners from Saturday’s race can be found at the Man vs. Mud official website. It was a competition of strength, stamina and who could get the dirtiest. Nearly 2,200 racers and a few thousand spectators came to the American West Heritage Center Saturday to take on Cache Valley's first ever mud run, a 5-kilometer (approximately 3-mile) obstacle course of slip 'n slides, spider webs, hay bales, wobbly bridges and mud pits. "It was awesome; it was so worth it," said Nick Denton, who ran the race dressed as a caveman with three of his friends. One of his teammates, Angie Smith, said she got mud in her teeth, had to stop and dig her shoes out of the mud, and lost her socks forever on the course. But she still had a great time. Racers paid $40 before the event and $50 the day of the race to navigate more than 27 obstacles. The course started with a huge water slide, followed by a "shooting range" where spectators could shoot racers with water guns as they ran by. Winding their way through the shooting range and a series of hanging inflatables, runners made their way to yet another water slide, followed by trenches of waist-deep mud. After climbing a wall of hay bales and traversing a muddy field, runners were rewarded with a cold cup of water before crawling through the "spider web" and attempting to run across a slippery, inflatable bridge. Those who didn't make it (mostly everyone) landed in the pond with a splash and waded through the water to the other side. At the end of the race, participants flew down one last water slide, ending with a splash in the biggest mud pit of all. Photographers awaited on the other side to take pictures of racers in all of their muddy glory. Although popular, Saturday's mud run was not without mishaps. Bumps in the first water slide launched a few people into the air, resulting in a hurt back for one racer. One volunteer at the scene said those who were injured at the water slide were able to get up and finish the race, and race organizer Mike Schaefer said there were no major injuries reported. Schaefer said they were able to pause the race, adjust the slide and continue without problems for the rest of the day. Racers were informed of potential risks and were required to sign a waiver when registering for the event. Schaefer, who organized the Man vs. Mud run with fellow Cache Valley resident David Knight, said far more people came out to the event than they anticipated. He said next year, he and Knight will add some "bigger, badder obstacles" and plan to accommodate at least 10,000 people. Runners were encouraged to wear costumes, and mudsoaked princesses, cows, chickens, the Flintstones family - and even a group of 12 friends and family members with pig noses, underwear on the outside of their leggings and capes that said "Swine Flu" - could be seen navigating the course. Prizes were awarded for best and funniest costumes, best and funniest team names, most energetic racer, best plank, best mud-pit performance and dirtiest (muddiest) girl or guy. "We've seen mud runs across the nation, but we thought it would be awesome to have one in Cache Valley," Schaefer said. "We had a lot of participants say that this is Utah's best. ... There's over 27 obstacles, four huge superslides that range from 125 to 200 feet, tons of mud and it's totally family-friendly. It's challenging, but not extreme." Kids 12 and under could run a mini version of the obstacle course, the "Boggy Bayou," complete with suds, an inflatable castle, tunnels, tires and lots of mud. Schaefer said at least 300 kids signed up for the Boggy Bayou over the course of the day. Schaefer said participants traveled to Saturday's race from 18 or 19 different states, with Cache Valley, the Salt Lake area, Utah Valley and other cities along the Wasatch Front well represented. A team of 40 volunteers was recruited to keep things running smoothly, and Schaefer said the race could not have been accomplished without them. Schaefer said people can check the Man vs. Mud official website, www.manvsmud.com, for photos and videos from Saturday's race. It didn’t rain, like some of the participants and event coordinators hoped, but Cache Valley’s first ever mud run —the 5K Man vs. Mud obstacle course and mud track— still entertained thousands of participants and spectators on a sunny Saturday, in Wellsville, Utah. Co-directors Mike Schaefer and David Knight organized a massive 5K track, in cooperation with the American West Heritage Center, which had runners sliding, crawling, sprinting, wading and jumping through a wide range of muddy obstacles. 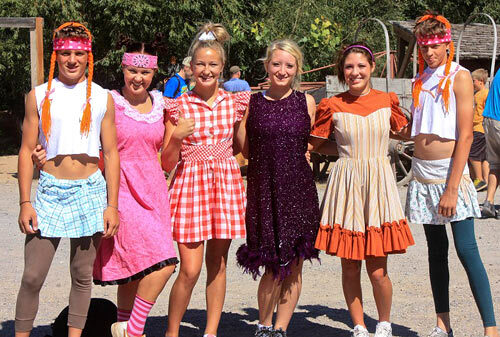 The event took place on Sept. 3, 2011, in the southwestern corner of Cache Valley where the majestic Wellsville mountains provided a late summer backdrop for a beautiful —albeit filthy— day of good, clean family fun. I was able to track down Schaefer and briefly ask him a few questions regarding some of the details of the event. He told me roughly 2,000 runners had registered by 1 p.m. (the first wave of 150 runners was released at 9 a.m.). Schaefer guessed that another 2,000 or 3,000 spectators were in the massive crowd that showed up to shoot pictures and psych out their friends and loved ones. When I asked how far some of the “muddites” traveled to take part in the fun, Schaefer said he saw registrations from as far away as North Carolina and Missouri. Tickets for the event were priced at $40 a pop in advance, or $50 the day of the event. I, personally, felt like this was a lot of money to pay just to roll around in the mud —something that, historically, pigs do every day for free— but surely I underestimate the value, not to mention exfoliant properties, of a good trudge in the sludge. There were strings of people racing around the track when I got there around noon. The local fire department was on site with its trucks so firemen armed with fire hoses could spray down the runners after they got caked in wet dirt. These Smithfield men, students of USU, came dressed as Captain America, The Green Lantern and a jailbird. They called themselves "Heroes vs. Villains." There were also several other attractions and diversions available at the venue, partly because the American West Heritage Center already includes certain amenities and sights, including gift shops, horse rides for the kids, and food and beverage vendors. The AWHC’s parking lot was not just full, but fields and overflow parking areas were packed with vehicles from all over Utah and surrounding states. There were cars parked all the way to Highway 89 —the turnout was epic. I have to admit, I was both surprised and impressed with how many people this event drew, especially because it was the first of its kind in our area. One of the other local websites, cachevalleymagazine.com, stated that Knight and Schaefer expected approximately 9,000 people to show up over the course of the day. When I was out there I could see that there were at least 4,000 people there in the couple of hours that I spent walking around and taking pictures. I was interested in finding out, too, with such a high registration fee if the money was going to benefit any charities or causes. Apparently, according to cachemagazine.com, Schaefer and Knight have a fundraising goal of $50,000. The AWHC will receive some of the money and ”some Cache Valley families in need of serious financial help” will be the recipients of the rest. As I walked around taking in the sights, I found several articles of clothing, like shorts, shirts, socks sneakers, that were abandoned. I guess the previous owners of these items figured it would be no use putting them in the washer at home —mud-logged clothing must not seem worth it to some people. The event website also suggested that costumes were a great way to make the day more fun. I saw a wide variety of groups who decided it was Halloween eight weeks early. One group of guys from Smithfield was dressed up as Captain America, The Green Lantern and a jailbird. They called themselves “Team Heroes vs. Villains.” The group seemed quite jovial for having mud everywhere imaginable. I also saw a group of five or six guys wearing blazers and ties without shirts on. I wondered, since I saw these guys on my way out, if they really knew what they were in for; and I hoped they weren’t planning on wearing those jackets to church the next day. The usual outrageously colored tights, ’80s garb and, of course, tutus, were other typical elements of the standard mud runner uniform. Aside from nearly having to threaten a muddy friend in order to keep him from hugging me —I’m a poor sport when it comes to getting dirty when I don’t want to be— I thoroughly enjoyed myself. And my friend certainly appeared to be enjoying himself. After talking to my friend, I was very happy to find out that I could get food and drink at regular rates, rather than the monopolistic prices you’ll see at concerts, movies, or airports. For those of you who now think I’m not really as much fun as I may think, don’t worry, maybe I’ll actually run the mud track next year. The wet plastic slide by the starting line that went down a huge hill and into a pit of muddy water actually looked like a lot of fun. If you’re thinking about attending this event next year, that is if Schaefer and Knight decide to make this an annual event (which I’m sure they will), there were attractions available this year for all shapes, ages, sizes and interests. You don’t have to be a mud lover or a hippie to enjoy Man vs. Mud. I would, however, suggest that germaphobes stay home or at least stay far away from the mud. Don’t forget to keep your eyes opened for the guy racing toward the fire hoses, that’ll be me… see you there! It was only a matter of time. And thanks to David Knight and Mike Schaefer, we didn’t have to wait long. The newest craze in racing around the country is taking runners off the boring old asphalt and shepherding them into mud bogs and other obstacles that make the race more about fun and the experience than personal-best times. Enter Man vs. Mud: a potentially very dirty 5K jaunt around the American West Heritage Center that’s slated for its inaugural running on Sept. 3. Originally from Central Utah, Knight met Schaefer, a native of Missouri, while they were both living in Tucson, Ariz. They soon decided that wasn’t where they wanted to be (not enough mud in the Sonoran Desert, perhaps?) and both moved up to Northern Utah. After operating several different businesses (including Cachedailydeals.com, which they launched in February), the duo decided to become the dirtiest race directors in Cache Valley. After looking at several different location options, they joined forces with the American West Heritage Center in Wellsville. The race will start just off of bluff west of the visitors’ center with a slip-and-slide, and proceed in a clockwise direction around the rest of the property. Runners will attempt to cross the pond on some floating pads, then will later have to run through a shallower portion. They’ll also be trenches, tunnel crawls and tire obstacles and a place where spectators can blast the participants with Super Soaker water guns, all leading up to the final mud pit just before the finish line. “It’s gonna be good,” Knight proclaims with a wicked smile, while also pointing out that they’ll also be a “Boggy Bayou” for kids 12 and under to try out. As of mid-August, runners can sign up for one of 15 different waves starting between 9 a.m. and 4 p.m. There are a maximum of 150 participants in each wave, and between runners and spectators, Knight and Schaefer are figuring that somewhere around 9,000 people will be at the AWHC at some point during the day. That would certainly help with their fund-raising goal of $50,000. The pair plans to split that between the American West Heritage Center and some Cache Valley families in need of serious financial help. “It’s basically just a really fun community event where we can really help the Heritage Center as well as some people in the valley,” Schaefer says. To register for Man vs. Mud, log on to their Web site at www.manvsmud.com. Registration fees are $45 until Sept. 2; $50 the day of the race if it’s not sold out. The best part, though? Weather — short of perhaps a blizzard — is not a concern. Logan, UT – June 9, 2011 – MAN vs MUD announced today that it is now accepting registrations for the inaugural MAN vs MUD 5K Challenge (www.manvsmud.com) While it will take place on a course 5k in length, the MAN vs MUD Challenge is no ordinary 5k race, but is the ultimate event for thrill-seeking athletes and ‘weekend warriors’ looking for a fun and unique challenge. • Mud Crawl. Pretty much what it sounds like. Mud. Crawl. • Water Fall. There will be water, and you’ll probably fall. • Spider Web. Making it through this web is easier if you wear a Spiderman costume. • Hay You. No horse could eat its way through this wall of hay. • and many more involving mud, water, walls, and other exciting and unusual challenges. Those who survive earn the title of true MAN vs MUD champions and get a clean t-shirt and fun goodies for their efforts. Prizes and Costume awards will be given. The MAN vs MUD Challenge is a proud to help our local community and those who truly need help. “We will be donating a portion of the proceeds from the MAN vs MUD 5K mud run on September 3rd to help families or organizations here in Cache Valley, UT. We want to help the individuals who need it most, and we want YOU to tell us about them”.